Increased temperatures and altered precipitation will make water, a limited resource in the arid southwestern United States, even scarcer in many locations. 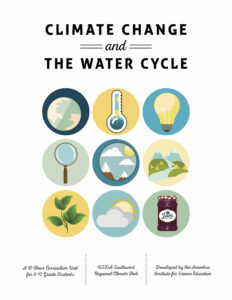 With the aim of fostering climate literacy in our future citizens, the Asombro Institute for Science Education partnered with the USDA Southwest Regional Climate Hub to create an engaging, fun, and scientifically rigorous education unit for 6-12th grade students. It is aligned with Common Core State Standards and Next Generation Science Standards. Check out the instructional video for “Ready, Set, Grow” – a lesson about the effects of climate change on primary producers. 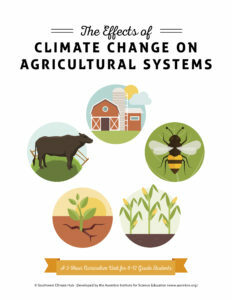 As the climate changes, increased temperatures and extreme events are predicted in the southwestern United States, which could impact crop productivity and food security. We partnered with the Asombro Institute for Science Education to design an engaging, fun, and scientifically rigorous education unit aligned with Common Core State Standards and Next Generation Science Standards. This unit is freely available and intended for use by anyone, especially educators of 6-12 grade students. The unit consists of five activities and was designed to be conducted over five days (or five hours). Each activity can also stand alone however, and the unit need not be completed in its entirety. This 4th and 5th grade, English and Spanish language activity guide was developed by the Asombro Institute for Science Education. 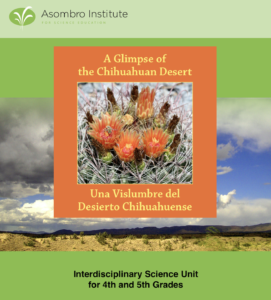 The seven hands-on activities are designed to accompany the bilingual book Glimpse of the Chihuahuan Desert by retired teacher and Asombro volunteer Patricia Mihok. Every activity includes a teacher’s guide (with background information in both English and Spanish), Spanish student worksheets, English student worksheets, and answer keys with sample data. Activities are aligned with Next Generation Science Standards and Common Core State Standards. Asombro hosts teacher workshops and loans kits of supplies to teachers who would like to implement the activities with their classes. Please contact the Asombro office for more information. Access our teacher’s handbook and student workbook for field trips by clicking the links below. The teacher handbook includes background information, pre-field trip activities, and post-field trip activities. This fun program from the Take It Outdoors, NM coalition (Asombro is a partner) encourages people of all ages to get outside and explore New Mexico.